sincerely interested in their customers satisfaction." Whenever goods are being imported to Aruba, import duties can be levied. Use this overview to estimate the duties on your products. Customs in Aruba will levy the final payable duties. QF Global Network provides Custom clearance providing we have all required documents. Import duties have to be paid in advance. Disclaimer: The information is intended as a guide on not as a complete or definitive source. At QF Global Network we have the tools in place so that you can shop global and receive your orders local! What is QF Global Network? As a lot of online merchants do not ship internationally, QF Global Network offers you a secure address in the USA or the Netherlands so receive all your online purchases. We take care of forwarding them to your country quick and efficiently! Can businesses also register with QF Global Network? Are you services also available in other countries? Currently we forward all packages and mail to Aruba. We are in the process of adding other countries. If you are interested in becoming an agent, please contact us. How frequent do you ship my packages to my country? From Miami, we ship twice a week and soon three times a week. From the Netherlands, we currently ship once a week. Can I have the postal services forward my mail to my QFA address? How can I pay for my packages? Several options are available : cash - credit card- debit card - money transfer or with company check. I don’t have a credit card. Can I still use QF Global Network? Yes, you can. With our Shopping Assistant service, we can place orders for you! How soon can I use my address after I have registered? As soon as you have verified your email address, you will receive a second email detailing your secure address which you can use right away. Can packages be dropped off at my QFA address? Yes of course. Please ensure they are clearly labeled with the shipping details. How are my packages shipped? Why was I charged for a heavier weight than the actual weight of the package? Freight charges are calculated on actual or dimensional weight of shipment, which ever is greater. QF Global Network reserves the right to assess transportation charges based on volumetric standards. 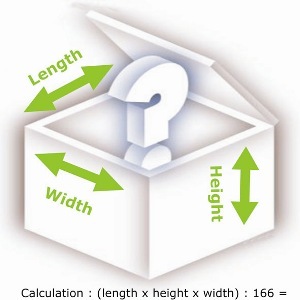 Dimensional weight is calculated by :length x width x height of each package (all in inches) and dividing by 166. If the dimensional weight exceeds the actual weight, transportation charges for the shipment are based on the dimensional weight. The online merchant only accepts credit cards with a USA billing address. What should I do? Either request your bank to add your US address as a secondary address on you credit card or we can place the order for you with our Shopping Assistant services. What are the import duties on, for example, car parts? On car parts it is 22%. As the import duties vary for each commodity please click on our import duties button for prices. Why do I have to send the invoice of my order to you? We need the invoice of your merchandise in order to prepare the required Customs documentation. Can I track my packages? Yes, you can track your packages from the time they arrive AT your QFA address through your QF Tracking. Just click on ‘Member Log In’ on the top of the menu bar and log in with your membership # and password. To track your packages TO your QFA address, we have added links to various carriers’ website on our home page, for your convenience. What is the QF Tracking? The QF Tracking enables you to adjust your account details as well as track your packages from the time it arrives at your QFA address to your country. How do I know my package has arrived at my QFA address? We will update your QF Tracking system and send an email notification. I did not enter my membership details in my order. How will I get my package to my country? We receive a list of unknowns that we scan. Please send us an email with the tracking number of the package so we can send an alert and put it on the next scheduled flight. Providing the incomplete details will cause delays with your shipments and possibly even refusal at your address. Can I receive cash or checks at my QFA address? Which items will not be accepted at my QFA address? We reserve the right to refuse any shipment, which by reason of the dangerous or any other character of its contents is liable in our judgment to soil, taint, or otherwise damage other merchandise or equipment, or which is economically or operationally impracticable to transport, or which is improperly packed or wrapped; or it is prohibited by any local or international laws. Regardless of any declared value for transportation, the liability of QF Global Network shall be limited to US $100.00 (Dollars) per shipment. We do not provide insurance coverage for merchandise valued over $100.00 (Dollars). Can I receive packages from other countries at my QFA address? Is there someone located at my QFA address to receive and sign for my packages? Yes, your address is secure and manned 5 days a week from 9 to 6 pm. I registered, but have not received my membership card yet. What should I do? It usually takes a few days to receive your membership card at your address. Please contact us at info@qfglobalnetwork.com to inform us if you have not received your card. Do I have to wait on my membership card to start to shop? No you don’t. As soon as you verified your email address, you’ll receive an email with all your details so you can start shopping. Can I register for both countries? Yes you can. In your QF Tracking you can add a country. You will receive an email with all your details. What is the USPS form and why do I need to fill it out? The United States Parcel Services form is to authorize QF Global Network to collect your mail and packages at the USPS office. The online merchant requires a telephone number in the shipping address. What is the telephone number? Once you have selected the item you want to buy, you will be prompted to fill out certain details to process the order : a billing address, shipping address and the credit card details. In the billing address, you fill out the address where you receive your credit card statements. In the shipping address, you fill out your QFA address. Normally, there is a second line available in the address, where you can put your QFA xxxx PMB details. If this is not the case, put ‘QFA’ in front of your name in the shipping address. Some online USA merchants require a telephone number for the shipping address. The number is 001-305-592-8700. ALL inquires have to be sent through QF Global Network via phone or email. Print the page with the details (price, size etc) of the products you ordered online, for your records. Note the tracking number of the company (Postal service, FedEx, UPS etc) that will deliver your products/shipments to your address. This way you will be able to track the progress of your order. Keep in mind that heavy and large packages/boxes can be expensive to air transport. Calculate the weight/size on the QF calculator before placing the order to verify the total charges for the items or request a quotation from QF Freight for ocean transport. In some cases, a relatively small item you ordered can be packaged in a very large box. The box could then be ‘Dim-weighed’ (calculation by: length x width x height of each package/box (all in inches) and dividing by 166). If the ‘dim-weight’ exceeds the actual weight, transportation charges for the shipment are based on the ‘dim-weight’. Email or fax us the invoices of your products/shipment that might require import duties fees, these are products/shipments with commercial value. This will speed up the process at the Customs offices (Douane). Shipments that require Customs Clearance take an additional 2 to 3 days to clear. Let us know if your items have arrived at your address and you have not received a notification from us within a few days. Send us an email with the tracking number of the package. Packages and correspondence with unclear or incomplete shipping addresses will not be shipped to any until country and member is verified. Items such as medicines, chemicals, cellular phones and radios are subject to approval by regulatory agencies. Two signed declarations and a copy of your identification are required and should be dropped off at the QF office, to complete the process. Some online merchants do not accept international credit cards. Contact your bank and add your USA address as a secondary billing address. Check your credit card statements regularly to spot any fraudulent purchases. Notify your bank right away. Unacceptable shipments : currency, human remains, drugs prohibited by law, precious metals, firearms and ammunition, alcohol, tobacco and tobacco materials. NEVER send a copy of your credit card with your ID to a merchant at their request. You have been tipped ! QF Global Network provides you with a physical street address and a designated POBOX address in various countries, which is exclusive for your use. You can order merchandise from many available merchants and have it delivered to your physical street address. Furthermore, you can receive letters, magazines and other correspondence at the POBOX. QF Global Network takes care of transporting all merchandise and correspondence to your destination country including customs clearance, as long as these comply with legal and customs requirements by authorities, both in the country of origin as destination country. By using our services, you acknowledge that you have read, understood and agree to accept the Terms and Conditions as outlined herein. You agree to pay all charges imposed by the Government of the destination country, agency and/or carrier charges, all customs clearance charges, import duties and insurance, delivery, storage charges in regards to your packages and correspondence. You understand that these charges are not included in the freight charges. Even if you give different payment instruction, you will always be primarily responsible for all charges associated with correspondence and packages that you receive, including freight charges, import duties, fines, brokerage fees and all expenses related to non-payment. You understand that this also applies for mail and packages that you did not request (for example junk mail), were opened or in a damaged condition or the contents failed to correspond to the items you ordered. All payments for services rendered and applicable charges should be received in full before or upon pick up or delivery of shipments. Import Duties have to be paid in advance. When payment is not fulfilled, QF Global Network reserves the right to withhold any and all shipments until FULL payment is received. You agree to pay 2% interest charges per month on the outstanding payment. After a period of 45 days, you give us permission to sell the shipment by public or private sale of which the proceeds will be used to cover charges and expenses. If any balance of your payment remains after the sale, you will still owe it to us. You agree not to have the these materials shipped to your address: currency, human remains, drugs prohibited by law, jewelry, precious metals, firearms and ammunition, alcohol, tobacco and tobacco products and hazardous materials, that are prohibited under regulatory departments of country of origin, or which are prohibited under the dangerous goods regulations issued by the International Air Transport Association (IATA). Any violation or charges incurred will be your sole responsibility. Packages shipped by USPS are not processed at the USPS office but transferred to a facility called the ANNEX. Upon receiving these items for the sorting process, the Annex scans the items as ?delivered? and that scan is shown on the USPS website. That is why the tracking result is misleading as the package is not delivered to the physical address. Since we are not required to sign for the packages, we cannot be responsible for any items shipped via the USPS under any circumstance. QF Global Network may inspect any shipment, including the opening of packages, to determine the adequacy of packing, or the existence and/or extent of damage, or the accuracy of the description of the contents, or the acceptability of the shipment for transportation. It is very important to submit your address correctly and in full as given to you. It is your responsibility to provide your correct address to companies, merchants, family etc that is going to send merchandise/correspondence to your address. Providing the wrong details will cause delays with your shipments and possibly even refusal at your address. Regardless of any declared value for transportation, the liability of QF Global Network shall be limited to US $100.00 (Dollars) per shipment for incidents including, but not limited to, any loss, damage, delay, mis-delivery, non-delivery, misinformation, any failure to provide information, or mis-delivery of information, or otherwise adversely affected, while shipment is in our possession or during pick-up and delivery. We shall not be liable for any interruption of service due to a cause beyond our control including, but not limited to airline delays, flight cancellation and climatic conditions, or to strikes, lockouts, or labor disputes. In addition, we shall not be liable for: improper packaging or incorrect marking of shipments, incorrect declaration of shipments, held in customs, or if the interruption or delays causes loss of income or loss of business opportunity. We shall not be responsible for packages and correspondence not received at the postal street address assigned to you. In case of damage to the shipment?s packaging (i.e. boxes, envelopes etc. ), a notation shall be made on the airway bill as received in such condition. No claims can be made with QF Global Network in regards to these damages. QF Global Network does not accept any claims for damage to the contents of the shipments. Claims should be filed with the shipper by you. All of our services and charges are subject to change without notice in response to cost increase and or any other factors that might affect the service. Please review the current service and charges information regularly. No rate change will affect the conditions of the Terms and Conditions for the time of its validity. It is your responsibility to let us know, in writing, when you will stop using your address to receive mail and packages as you will still be responsible for any and all charges resulting from arrival of any mail and packages to your address. You are in charge of re-directing your correspondence from the moment of termination of the QF Global Network service. We make no warranties, express or implied, and expressly disclaim any and all warranties. Our bi-weekly newsletter buzzes with the latest shopping trends, online shopping tips, member questions and lots more great information.